University of Nottingham > Blogs > Alumni Life > Remembering Nottingham > Wings in the Portland Ballroom – surely not? Wings in the Portland Ballroom – surely not? Over the last 100 years there have been iconic people, places and events associated with The University of Nottingham. Alumni remember them all and many stories about them have been featured in Alumni Exchange Magazine. For the first time the Remembering Nottingham Blog will reproduce some of these articles. Feel free to add your own memories or take the stories a stage further. 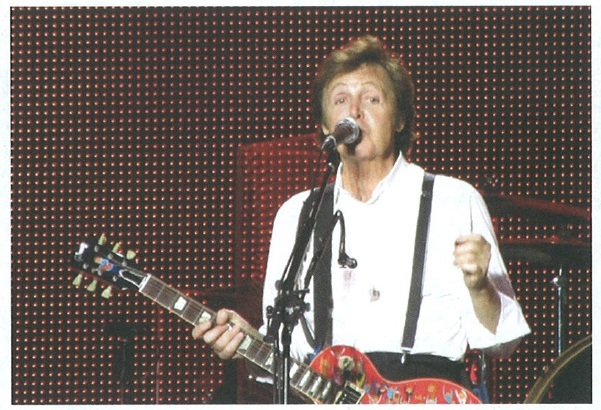 In the first of our series, we have reproduced a piece from our 2011 magazine which celebrated the anniversary of the famous Paul McCartney and Wings gig in the Portland Ballroom in 1972. Former Wings guitarist Henry McCullough returned to the University more than 40 years after one of rock’s most surprising debut gigs – the day when Nottingham students could barely believe a former Beatle was playing a lunchtime gig, a day which has since gone down in rock and roll history. Were you there too? If so, leave your comments below. Enjoy the feature, originally printed in 2011. . . The re-release of the celebrated and most successful Wings album Band on the Run has led to former Beatle Paul McCartney reflecting on the band’s first ever gig . . . at The University of Nottingham. The album initially came out in 1973 but was re-released on November 2, 2011 as the first release in the Paul McCartney Archive Collection. The Wings gig on 9th February 1972 has gone down in alumni folklore at the University but little is reliably known about the gig itself and we’d like to hear from anyone who remembers the performance or who has any photographs of the event. The idea of the Wings tour of 1972, the year before the release of Band on the Run, was that the band would literally turn up at universities unannounced and ask to play. In an interview with Will Hodgkinson of The Times McCartney said: “To give you a taste of what it was like, we would look at a map and say, ‘Ashby-de-la-Zouch . . we like the sound of that. So we drove there, and no offence to the people of Ashby-de-la-Zouch, but it didn’t seem like much more than a signpost. So what does the man himself remember of that impromptu concert in the Portland Ballroom at midday on Wednesday 9 February 1972? Alumni Exchange asked him . . .
Why did you end up at Nottingham? “We decided we’d just go on the road with no plans; no hotels booked, no gigs booked a complete blank canvas. So we set off with the band, the family, the dogs, the babies – up the motorway. We headed north and saw a sign that said Ashby de la Zouch so we got off the motorway there and asked where the nearest Uni was. This became the idea that the only place we could maybe find a captive audience would be somewhere like a Uni, so we were directed to Nottingham Uni and that’s how we found it. It was the first time we had tried that idea. I’m really glad we did. It’s a completely off-the-wall idea for someone who had been in The Beatles, to go and completely start from scratch again and, you know, looking back at it I was like, why did we do it? And it’s still like that, but it was great and it was a great memory. We had some laughs – you can imagine some of the hotels we managed to scrape into! We could literally get there about 7pm at night, and there wasn’t the greatest selection left by that time of night! But it was really fun and great bonding experience for the band. What do you remember about the gig? “I remember having 11 numbers to play and having to repeat a few, pretending they were special requests from the students. What would you say to all those fans that packed in to watch the gig and still treasure the memories of that very special lunchtime? “It was really great they were there to share it with us – we were extremely thankful that anyone showed up for us. It’s a great memory so it’s nice they can share that very nice off-the-wall experience with us. It must have been good fun. I can imagine it would have been great if I’d been at Uni and a band like us showed up. It must have also been nice to see Wings in their infancy! I think it was the first time we’d publicly played. When do you plan on returning? “A good question and I’ll give it considerable thought. Click to see a video interview with lead guitarist Henry McCullough on his memories of returning to the University for this impromptu gig. Remember it well – none of our friends would beleive us when we said wings would be giving a free concert and to come along – the same friend later blamed us for not ”making” them believe! Unforgettable. I particularly remember the band repeating several numbers towards the end! It was certainly an extraordinary experience to be present for their first ever public gig – and free as well! I was in the union offices typing up a University Sailing Club newsletter when some guy came in asking whether his band could do an impromptu gig somewhere on campus. I didn’t hear the subsequent discussion, but later I heard that Paul McCartney’s band had played on Campus (Portland Ballroom? I seem to remember it might have been somewhere less auspicious). Regrettably I didn’t make it to the subsequent free concert, but I remember that it was reported that the playlist was a bit thin and involved several repeats. I failed the year. And the next.